Hot, arid, humid, muddy: the situation in the Myanmar refugee camps in Bangladesh changes drastically in a day. It changes so rapidly that it is hard to tell there were pouring rains even 20 minutes ago. In the camps of make-shift shelters, most of the men and children are outside during day because the temperature within the shelters makes it unbearable to stay indoors. But most women and girls feel obliged to stay indoors due to cultural norms. For many women and girls, a big green shelter, surrounded by green fencing, is a symbol of peace. These women-friendly spaces (as humanitarian organisations call them) are commonly known as Shantir Ghor (house of peace) among the women who live in the camps. 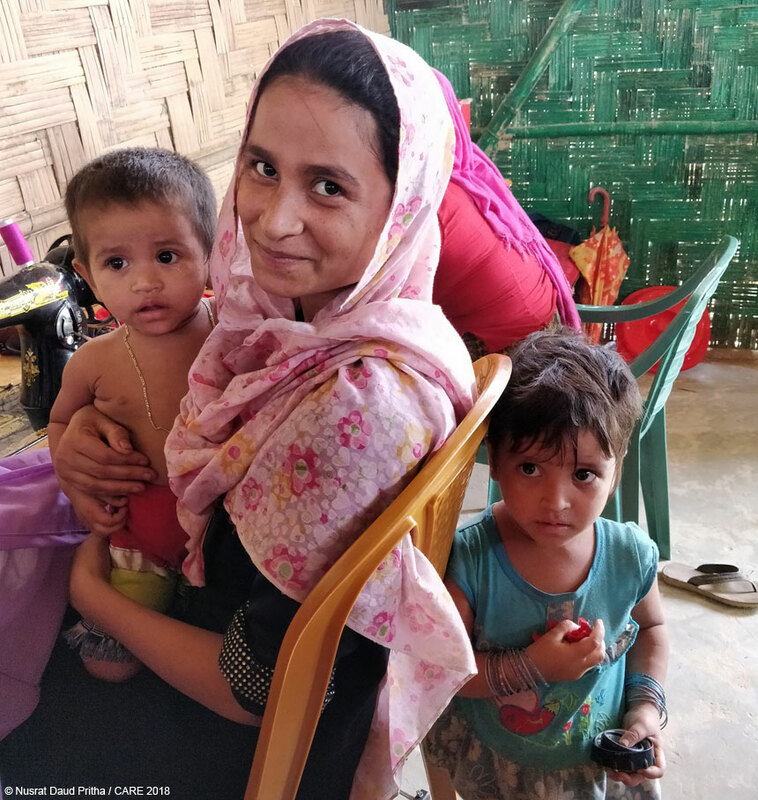 CARE operates five women-friendly spaces across various camps in Cox’s Bazar. Noor Hasina is a regular visitor to the women-friendly space in Jamtoli, Camp 15, which opened in May this year. Compared to her 17 X 12 feet tarpaulin shelter, this is a big open space. It is cooler, it is peaceful, she can rest here, and most importantly she can sew clothes here. We could stay in groups indoors, but this was not allowed outside. We feared being attacked if we travelled in pairs or groups. The women-friendly spaces set up by CARE provide a space for women to find refuge, rebuild community, seek advice and support on gender-based violence, and other counselling as required. Materials for recreational activities including indoor games and training sessions are also available in these centres. The women-friendly space in Jamtoli also provides five sewing machines so that women are able to make clothes for themselves and their families. Hasina learned sewing back in Myanmar. A UN agency ran training programmes for women in Myanmar and Hasina picked up the skill from there. Since May this year, using the sewing machines in the women-friendly space, she has already made 10 pieces of clothing. Life is not easy in the camps. It is hot, we worry about our safety, and we have to go to collect rations, cook and look after the children. But when I am here, sewing, I forget all my worries, all my losses. I feel happy. In Myanmar, women are married at a very young age, and for this they face many difficulties. I don’t want my daughters to face that. I want them to study and grow up and do some proper job before they get married. Story and photos by Nusrat Daud Pritha, CARE Bangladesh. Read more about how CARE is helping Myanmar refugees on our Myanmar refugee crisis page.